Over the last couple of decades there have been several biographies published relating to personalities from the bare-knuckle era of boxing. Jon Hurley is responsible for two of them - namely 1996's Tom Spring: Bare-knuckle champion of All England and 2009's Tom Cribb: the life of the Black Diamond. Truth be told, these two volumes are a somewhat mixed bag, with the Spring book far superior to the Cribb offering. As a Herefordshire man himself, Hurley's passion for Spring and his local area shines through his first volume, which successfully evokes the feeling of both rural and city life, thanks to some well-chosen references and some elegant and evocative descriptive touches. Hurley's research is sound and thorough, and the lavish use of illustrations throughout the book is admirable, attractive and illuminates his subject. If evoking time and place is one of Hurley's strengths then the same cannot be said for his analysis of Spring's character, personality and motivations. Unlike the very best biographers, Hurley never really gets under Spring's skin or reveals anything terribly personal or insightful about him. As a result Spring emerges as a somewhat enigmatic figure. His gentlemanly nature is stressed, as well as his highly skilled pugilistic abilities and formidable powers of determination, but there is little worthwhile insight beyond that. Nevertheless, despite its slight nature when dealing with character and motivation, Hurley does succeed in crafting a superbly readable and enjoyable narrative, for the first three-quarters of the book at least. Unfortunately, the final third of the book (once Spring has retired) often lapses into a somewhat mechanical and tiresome chronological account of fights in which Spring played a minor role, either as a second or manager of other boxers, without offering much illuminating comment. Furthermore, the book's absence of significant social and historical contextual comment or analysis is also a flaw. These are relatively minor quibbles, however. Taken as a whole, this is an elegantly written and hugely enjoyable volume, written with both care and love, which succeeds in shining some much-needed attention on one of the many forgotten but significant figures of English sporting history. A good measure of a biography is whether or not, after reading it, you feel the need to check if another book on the same person exists. In this case I'm happy to declare that Hurley has left little, if any, room for a further tome on Spring; in other words, aside from the shortcomings listed above, this is a pretty definitive work, which represents a fine achievement, particularly as it appears to have been Hurley's first book. Despite its merits, the book's influence on Richmond Unchained is slight. I only found a reasonably priced second-hand copy very recently, so I had already completed several drafts of my book by the time I read it. Nevertheless, there are a couple of interesting anecdotes about Richmond within Hurley's book, even though he is wrongly referred to at one point as Tom Richmond! 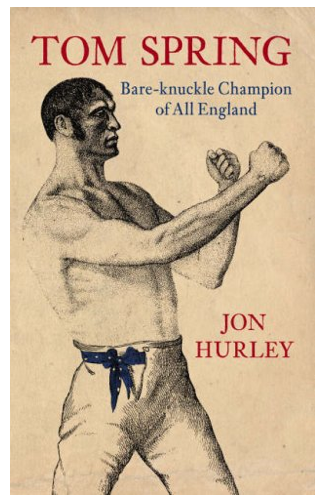 All in all, Tom Spring: Bare-knuckle champion of All England is a meritorious volume which is well worth seeking out in a second-hand store (Amazon marketplace currently have several copies for sale, albeit at quite high prices). It's also worth listening to Hurley's appearance, alongside legendary sports journo Frank Keating, on Radio 4's Great Lives programme in which the duo argue for Spring's greatness. 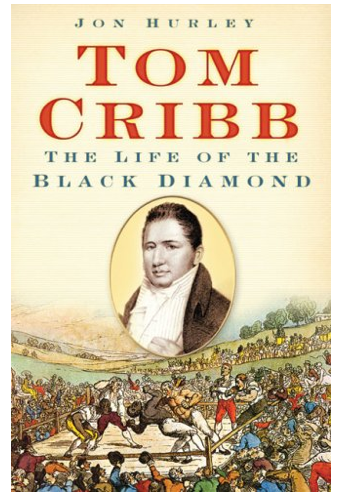 Sadly, Hurley's second 'bare-knuckle biography', Tom Cribb: the life of the Black Diamond, is nowhere near as accomplished as his work on Spring. The research is less thorough and and the contextual flaws of the earlier book are even more pronounced, particularly considering Cribb's vast socio-cultural significance. Hurley's account of the first Molineaux versus Cribb fight is particularly disappointing, in that it fails to address any of the controversies or conflicting accounts which surround this monumental event, as well as offer any adequate analysis of the contest's racial, national and international significance. Indeed, a lack of historical rigour permeates the whole book, with frequent examples of stories and anecdotes from later, and somewhat unreliable sources - such as Miles' Pugilistica - being accepted as fact without the slightest hesitation or any sense of due caution and historical diligence. Bizarrely, Hurley's writing style has also undergone an unwelcome metamorphosis since his first book - whereas the Spring book was written with elegance and restraint, the Cribb tome is littered with painfully embarrassing and inappropriate uses of figurative language, most of which rely on modern reference points. For example, when Jem Belcher is knocked down Hurley states that he "went down like Linda Lovelace", while Cribb at one point is described as "moving like Darcey Bussell". This stylistic misjudgement is so grating that it spoils what would otherwise have been a perfectly readable, albeit somewhat uninspired book. Cribb is a huge figure in English pugilistic history - scratch that, he's a huge figure in English social and cultural history, who is deserving of a definitive, comprehensive and all-encompassing biography. Hurley's book, quite simply, isn't it. Indeed, it's a book which I can scarcely believe originates from the same source as Tom Spring: Bare-knuckle champion of All England - it fails, by quite some distance, to build on the promise shown by that volume. One final point: in common with most other pugilistic historians and writers, Hurley makes the mistake of referring to Cribb and Bill Richmond as lifelong enemies. The truth, as you'll discover in Richmond Unchained, is much more interesting and complex than that.